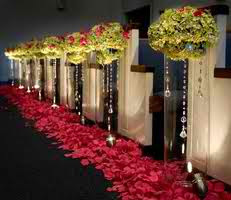 Aisle petals are a common last minute add-on in our business. Usually, clients see a pretty picture in a magazine of an aisle covered in petals or two very simple rows lining either side. Of course this seems like a reasonable addition to the flower order. How much can petals cost, right? This aisle has a lush bed of petals lining it all the way down. This is a very common request by our brides and the price can vary greatly depending on the length of the aisle. 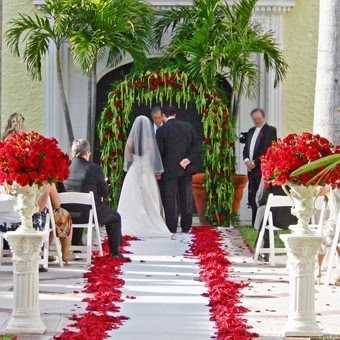 Our estimation is that 6000 rose petals can give you a similar coverage for about 15-20 feet. Let’s say you have a 40 foot aisle (which would need 80 feet of petal for both sides). 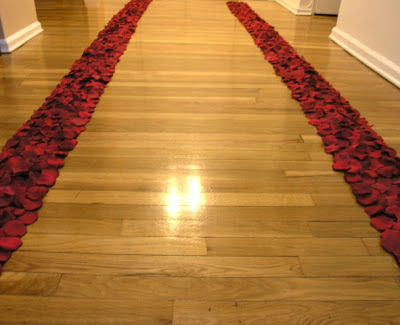 Conservatively, you would need 24000 rose petals to achieve a similar look for both sides of the aisle. Starting to sound pricey, right? Pricing the petals is a bit more difficult. Some florists can order boxes of petals from wholesalers that sell them at a reduced price. Sometimes colors can be limited or substituted. Other florists prefer to buy the roses and make the petals themselves. The least expensive way is usually the boxed petals. In our market, a box of 6000 petals can range anywhere from $200-225 and up. Of course this can fluxuate if a specific shade of a color is needed and would be considered a special order. 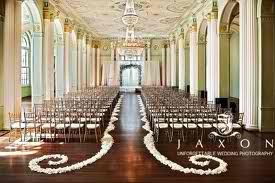 So, using our estimations, a 40 foot aisle would cost about $800 to have petal coverage like the picture above. 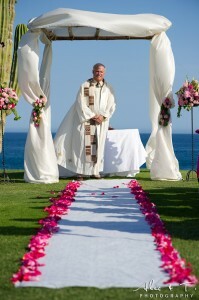 Certainly, you can save a little if you don’t have as many petals covering the aisle, but keep in mind, even half as many would still be a fair amount to consider as a last minute add-on. Some websites also sell rose petals, but think first! When you purchase them yourself, you will need a cool place to store them and you will need someone on the day of to be in charge of placing them. Most importantly, always check with your wedding florist before purchasing any fresh goods that are not from them. Using your newly acquired math skills, take a look at the pictures below and “do the math” on these aisles! If you are considering aisle petals, we hope to inform you enough that you can budget for the aisle of your dreams in the beginning instead of hoping you can afford it later.